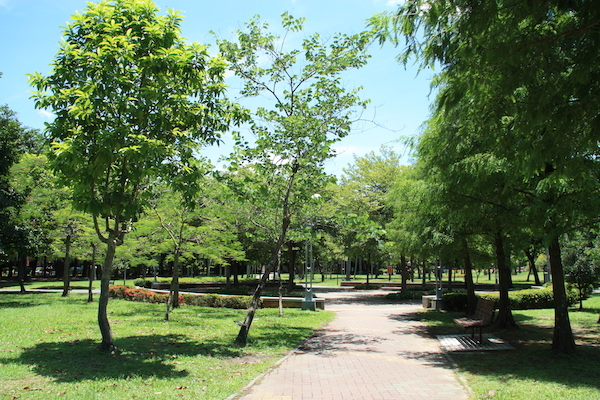 Daan Park is a green oasis, centrally located in Taipei. It’s one of the best large green spaces to run. The 64 acre park is lushly landscaped, with roads and paths lined with trees such as camphor, cajuput, ficus and maples. Bushes and flower beds are planted throughout the park to help make the park into a lush, green space. There are numerous athletic fields, a pond, and an outdoor theatre. There are many paths of various surfaces. A loop around the perimeter path, which features time and temperature displays, is about 2.5 km. It’s a good spot to run at night as it is well lit.